We argue over liberal vs conservative, but it’s not whether, it’s when: risk-prone, risk-averse, and even risk obligate are needed at different times. What does Liberal vs Conservative Mean? For many citizens in the United States, liberal vs conservative simply mean Democrat vs Republican. For instance, take a look at the liberal vs conservative opinions this review. They are largely indistinguishable from the majority opinions of Democrats and Republicans. That’s a problem; there are Blue Dog Democrats who are conservative on many issues, and Log Cabin Republicans, who are liberal on other issues. Clarity is needed. Wikipedia is a great place to start for an overview of liberal vs conservative politics, particularly within their historical contexts. The problem with these explanations is that the two words also apply to wide areas beyond politics. A conservative investor can be quite liberal with her donations. We can dress conservatively, then liberally use cologne. We can take a very conservative reading of great literature, or we can be very liberal in our interpretations of it. Even in the political arena, the concepts aren’t as clear as one might imagine. Conservative laissez-faire capitalism is the most liberal approach to free markets. Liberals can take very conservative interpretations of certain Constitutional Amendments. In addition, the viewpoints change. The government that conservatives so vigorously defend was founded in 1776 as a liberal democracy; on the Continent, that democracy was viewed as something well beyond liberal, it was dangerously radical. Public education was once a liberal issue, but today all parties agree on the importance of it (although admittedly disagreeing on the particulars). Environmental issues began as liberal initiatives, but the Christian right has recently taken up defense of the environment as a facet of stewardship. We see that despite all of the polemic rhetoric, in reality all of us are both, we are all a mix of liberal vs conservative. And we change. So despite the partisan passions, the issues are not clear. For all of the foregoing reasons, I want to depart from the historical, philosophical and popular approaches, and look at liberal vs conservative in functional, pragmatic, and even biological ways: What do liberal & conservative do? What are the effects of their ideologies? When should we pursue one or the other approach? What do liberals and conservatives each contribute, not just to politics, but to all of life? If we start at the most basic level, to ‘conserve’ means to stay with the traditional, i.e., with the tested, and the safe. Liberal has a less specific meaning, as it simply denotes freedom; conservative libertarians draw on the same word root. But when pared with conservative, liberal means to be free of our traditions, and to be free to change things. In some explanations, conservatives and liberal are seen as the ‘haves’ and the ‘have-nots’. The haves wish to keep the status quo; the have-nots want change. And so economic conservatives want to protect their money, social conservatives want to protect their social standing. In business and biology, we rephrase the problem as risk-prone (or risk-seeking) and risk-averse. When we are in danger, we should take risks, try new things, be liberal. When we are succeeding, we should avoid risks, and stick to the proven. Liberal vs conservative. Or sort of. The most politically conservative entrepreneur will take enormous calculated risks in the market place. On the other hand, the extraordinarily poor nomad is the most conservative of all, even though he has very little. So an explanation based on resources is not perfect. And a strategy has emerged in the past 100 years that creates a third possibility, and even a necessity. Through innovation, civilization is changing rapidly, even accelerating. To remain competitive we must constantly innovate, which means we must constantly take risks. So in addition to risk-prone and risk-averse, to remain competitive we become risk obligate: modernize or lose. And so we see big money, conservative on many issues, wild-eyed liberal on various aspects of innovation. And in non-obvious ways, that leads to a certain social liberalism. Whatever one may think of other races, sexualities, and lifestyles, the people within those groups vote with their dollars. That forces corporations, highly conservative in so many ways, to be risk obligate. They must very aggressively pursue liberal customers and liberal market strategies, in order to market to people with non-traditional ideologies. The importance of social diversity and inclusiveness creates other pressures for business and local government to become socially liberal. Because innovation has become key to economic competitiveness, the Creative Class® – those cutting edge scientists and designers who generate innovation – have become essential to competitiveness. Those innovators tend to be highly diverse, and wish to live in places that are tolerant, where their diversity is tolerated. This produces another situation where we must be risk obligate. First, there is an indirect pressure for municipalities to cater to, and even recruit diverse and often liberal groups of people, in order to create and grow innovative businesses. But there is direct political pressure as well, from competitive industries. Currently we see the clash of innovators and local government taking place in states and cities that resist tolerance, as large industries avoid such places, and even shutter local offices when intolerance emerges. Nevertheless, sometimes we need to be conservative. Most of the time, really; in the vast bulk of what we do, at work, at home, in town, we follow the old ways, and those generally result from traditions: laws, customs, or essentials. Respecting personal property is conservative law. Neckties for important events is conservative custom. Cooking food to remove disease and parasites is a conservative essential. However, in certain situations all of us in choose to try new things; we choose to be liberal. At times, we have to be liberal. The military is one of the most conservative organizations around, but in order to remain competitive it is often forced to be liberal, not just on technical issues, but on social issues. And in the chaos of warfare, some liberalism is absolutely essential. The ability and willingness of grunts to innovate on the fly and even disobey orders is often key to success: in the battle, in the war, and in the democracy. It is critical that we recognize these functional distinctions between liberal vs conservative, and stop thinking of them as inflexible labels. We need to avoid committing to one or the other, and focus on pragmatism. A race, or a voyage? We are currently being trapped by divisive politics. While liberals and conservatives fight with one another, we are distracted, we ignore the important issues, and powerful interests profit from our anger and disunity. The problem is, disunity can grow and take on a life of their own, and currently we see that it threatens to burn down the whole divided house. We should not not overly commit to one political ideology or the other. We must be pragmatic, we should be willing to reconsider the realities, and be ready to change as the situation changes. There may be a middle ground that will address the concerns of both sides, and provide a superior solution. And we need to raise our children, and design our educational paradigms, so that future generations will be more flexible in their outlook and more nimble in their responses. Pragmatism is key. So the question is not whether liberal or conservative, but when liberal or conservative. Once we change the question, we can start to talk intelligently, compromise, and free ourselves of crippling dogma and partisan blinders. 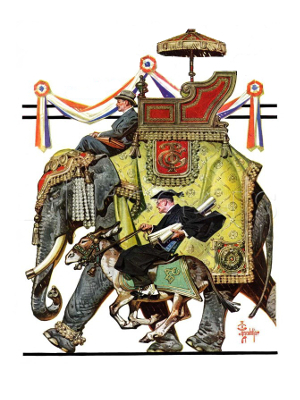 Elephant and Donkey, illustration by J.C. Leyendecker.